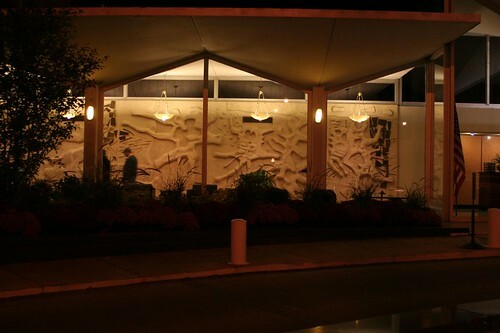 If you drive down LSD enough at night, you've seen this striking MidCentury lobby. It joins two massive 1962 apartment towers at 3550 Lake Shore Drive. Though the folded plate roof is modestly interesting, it wouldn't be enough to make the lobby a real show stopper. 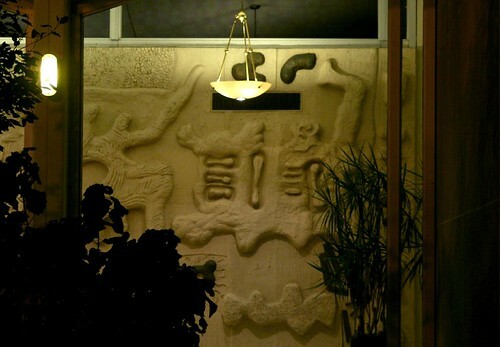 What does the trick is the abstract sculpture running the length of the lobby. 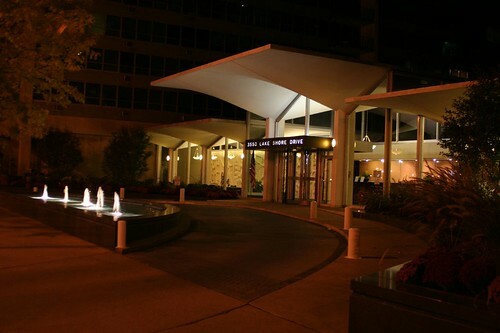 I used to live there and it was even more mid-century fabulous until they replaced the original light fixtures in the lobby with those brass-finish '80s pendulums. 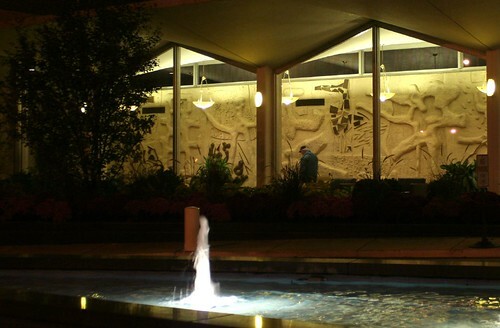 The security doors were twelve-foot-tall solid glass with beveled edges, later replaced with much shorter and bulkily framed doors. And the corridors were monstrously redecorated around 1992 with chair rails and carpet that looked like a putting green with a purple floral strip down the middle. When I sold in '04, that was still the decor. With any luck, they hired a decorator with some sense. At one point they were going to paint the marvelous tall wood panels on the side lobby walls, but I like to think I played a small part in convincing them not to do it. The condo board president was in the south side lobby with someone giving an estimate on painting and I overheard them and said "Oh, please don't. It would be a terrible mistake that could never be undone and from now on you'll be repainting the darned things every couple of years. They don't make walls like this anymore." The board decided against painting, although I expected them to go through with it just as they generally did with so many other unadvisable re-dos. The new exterior windows on the towers in 2003 were a definite improvement. I kind of miss the place at times, but traded the confined quarters there for a mid-century mod house on an acre of woods in exurbia and can't say I regret it, except for all the right-wing Republican neighbors.